This list begins to trace the history and development of Victoriana and Steampunk RPGs. I did this earlier with Horror RPGs. I focus on tabletop games, though many video games could easily fall into this category (the classics Thief: The Dark Project, Arcanum and Final Fantasy VI). Because of these two concepts have been tied closely, I opted to link them for this list. I could have presented them individually, but the lists would overlap heavily. Victoriana’s reasonably easy to spot, but Steampunk offers more of a challenge. There’s a good deal of debate about what constitutes Steampunk- resulting in many argument panels at various conventions. I think of it generally as a set of design and aesthetic elements- generally recognizable symbols. If it had a political or social content at the start, that’s been streamlined away in favor of “the look.” Like other subjective genre elements it has a continuum, with some books, movies, games and TV shows having embracing it fully and others just throwing in some knobs and goggles. Victoriana: Material set in the Victorian period and in England or greater Europe. Alternately referencing the British Colonial Experience. Also where a game explicitly embraces the culture despite not being of the period or place (i.e. Unhallowed Metropolis’ Neo-Victorian setting). This includes games which focus on the imagery and society, but perhaps without the technology. Steampunk: Games which call themselves steampunk and reference the ideas and aesthetics of it. Steampunk-esque: The most subjective of the definitions. Games which borrow or rework the images and concepts of Steampunk. Reasonable persons may disagree about this categorization. Something like Children of the Sun’s Dieselpunk or Eberron’s background material owe a debt to the style. I’ve focused on core game lines or supplements offering a significant shift or change to the setting. So if one module offers some steampunk bits, I’ve left it off the list. 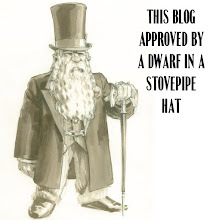 For example both Fringeworthy and GURPS Alternate Earths present secondary materials for Steampunk or Victorian settings, but they’re a fragment. After much consideration I left off Orrorsh, part of the TORG line because the brief Victorian Empire mention feels like window dressing. I’ve also tried to stick with publications from companies as opposed to homebrews or free PDFs. In some cases I make an exception where the product’s gained attention or generated a line. I've also skipped boardgame/rpg hybrids like Steve Jackson's Undead. In some cases the uses of steampunk are novel, but incidental to the whole of the product. For example, Justice, Inc and other Pulp RPGs offer what could be read as steampunk inventions or adversaries. In general, I think those fit more closely with the Pulp and Heroic Fantasy genre. That’s a judgment call on my part. I’ve left out a few other things that didn’t quite fit for me. For example, Warhammer Fantasy doesn’t appear here despite the heavy Steampunk elements worked into several of the races in the original miniatures source material (Dwarves, Orcs, Skaven). I also left off Mutant Chronicles despite it looking more than a little Steampunk. I welcome discussions and suggestions as I work through these lists. I've arranged the items chronologically and then alphabetically within the year of publication. I hope to put out a new list bi-weekly. I’ll break the time periods down arbitrarily, trying to keep 20 items or less per list. For references I’ll point to Ann & Jeff Vandermeer’s Steampunk which has some short but decent essays on the topic at the back. Jess Nevins’ Encyclopedia of Fantastic Victoriana is also worth reading (as well as his annotations of the LXG books). I was aided in my research by several different websites, notably the Victorian Adventure Enthusiast. I've seen several different blogs and posts trying to compile a complete list of the genre, I hope this supplements and expands those. (1983, Victoriana) The first Victorian RPG, but one which never reached a wide-audience. While this lacks a full entry in the RPG Geek database, it offers some information, "A British RPG set in 19th century England at the height of the Empire. The first edition rules (1983) were fairly simple but included a large amount of background information on the setting and times. The second edition (1985) expanded the rules considerably." The notes I've seen on this suggest it was a purely historical game, something of an oddity in the early days of the hobby. 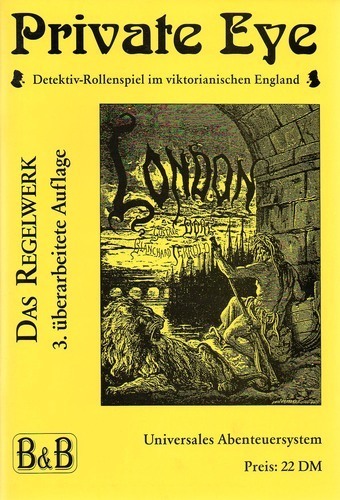 (1984, Victoriana): From RPGNet, "A backgroudn (sic) setting for To Challenge Tomorrow, depicting Victorian London with an occult tinge. Contains a 20-page scenario book, a 12-page guidebook, and four 8-1/2x11" maps." Seems to have had a revised edition in 1991. (1986, Victoriana) Just as Call of Cthulhu kicked off Horror games, CoC leds in bringing Victoriana to the mainstream tabletop. It certain makes sense given the late Victorian-era horror influences on Lovecraft: Stoker, Poe, Machen and Blackwood. Beyond that there's the general tone of the Gothic which had great success and impact during the period. It offers the terrible figure of Jack the Ripper and the prototypical detective of Sherlock Holmes. Cthulhu by Gaslight's the first real "reskinning" of Call of Cthulhu. It came out the same year as Dreamlands, which could argued to be an expansion rather than a new frame. Cthulhu by Gaslight has had three editions, the most recent in 2012. The original volume focuses exclusively on 1890's England, including a pull out map of London of the period. More than anything it offers a solid and distinct sourcebook for the era- somewhat useful for other rpgs as well (if you're interested in London). Eric Dodd has an excellent and throughout review of the first edition set, British Empire Cthulhu - Holmes v. the Mythos, which suggests gamers should hunt down the most recent edition if they want an wide-ranging and more complete product. 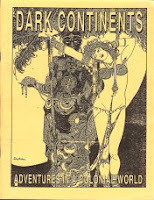 (1986, Victoriana): From the RPG Encyclopedia "An Italian-language investigation RPG, in the style of Sir Arthur Conan Doyle and Agatha Christie. The original game was focused on pure investigation. The second edition added rules for action investigations including firearms, car and foot chases, and more. The second edition also shortened the title to "Holmes & Co."
(1988, Victoriana) The British Empire extends its colonial reach to Mars. Well, actually all of the colonial powers do- creating a space race combined with of the deadliness of the Great Game in Afghanistan. Space 1889 could be read a little as steampunk- there's the strange alternate science of luminiferous aether and the proclivity for flying ships. But those feel more like set up and background elements. The game focuses on a celebration of a certain idea of high romance and the Imperial Age. There's little in the way of soot and grime in this presentation. There's some late 20th century questioning about the politics of colonialization, the concept of the "noble savage," and so on. But GMs can decide how much of that they want to play up. In my mind I always associated this with enthusiasts of The Sword and the Flame especially after GDW published miniatures rules for the setting. 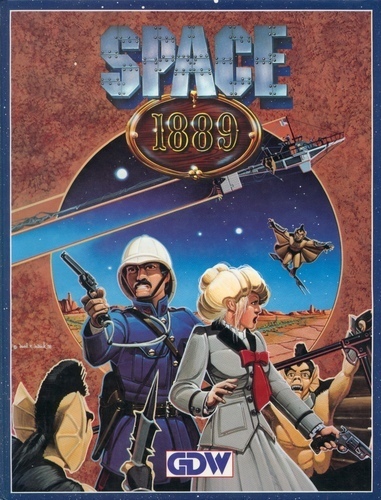 For an oddball game from a defunct company, Space: 1889 has had an impressive lifespan. GDW published 20+ products for the line. In 2000 Heliograph picked up and began to reprint everything. Then in February of 2013 Chronicle City announced that they would be doing an all-new English language version of the game. I'm curious what that will look like. Given the development and expansion of steampunk as a genre, will they incorporate more elements of that (art and otherwise) into the new product? Or will they maintain the feeling of scientific romance and nostalgia for empire? (1989, Victoriana) Another setting supplement for To Challenge Tomorrow. This has the players exploring ancient and hidden lands. It draws on Haggard and Burroughs for inspiration. It appears to be something like a Colonial Hexcrawl, with players unsure about what's over the next ridge. Just as classic D&D drew on the boardgame Outdoor Survival, this one seems to draw on The Source of the Nile. A revised edition appeared in 1991, and a heavily revamped one in 2000. (1990, Steampunk) A setting sourcebook for the French generic RPG SimulacreS. It presents a distinctly Verne-ian backdrop set in the late 19th Century. I love seeing these non-English language games. 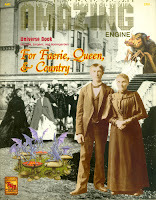 Arguably this would be the first stand-alone steampunk rpg sourcebook. 1990's an important year for Steampunk. While there had been some important precursors (Moorcock, Blaylock, Jeter, Roberts), that year saw the publication of The Difference Engine. Gibson and Sterling's novel is arguably the first explicitly steampunk novel to reach a mass audience. (1991, Steampunk) from Wikipedia, "is one of the earliest steampunk role-playing games, created by Kenji Fushimi and originally published by Tsukuda Hobby in 1991 in Japan…The game is set in the world of Machiloney that is similar to Europe in the 19th century. There are not only steam-driven machines but also magic, monsters, the evil empire named Valmon and a mysterious ancient civilization. Its setting resembles Castle Falkenstein to some degree, but Gear Antique was published 3 years earlier…The game has the special feature in its life-path charts. In the Renaissance Edition, player characters decide their entire life from the cradle to the grave during character creation by using life-path charts. For example, history of schooling, the person who to marry, number of their children and cause of death are all already decided before starting the game." (1993, Victoriana) A setting sourcebook for TSR's ill-fated Amazing Engine rpg line. It offers an alternate history with magic and the fae as a vital and prominent force. It has a distinct magic system and extensive notes on the faerie of the period. There's a focus on the players solving problems and fighting crime, ala Holmes. Players can play non-humans as well as humans. It has a very cool and garish map of England. I lost my copy in the fire, but I recall this as a brief and interesting sourcebook. it had many cool ideas, but desperately needed to be expanded and developed. The core concept could easily be reworked into any number of more modern Victoriana games. Perhaps we'll eventually see a pdf reprint of it. (1993, Victoriana/Steampunk) A shareware rpg which has been evolving since 1993. The brainchild of Marcus Rowland, author of Diana: Warrior Princess, Forgotten Futures and its various supplements can be found online. 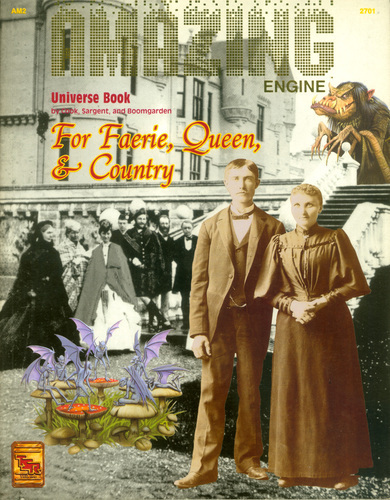 It focuses on the late Victorian period and scientific romances ala Verne and his emulators. FF offers a core game engine for many different worlds. Most of these have been drawn specifically from authors of the period- Doyle's Challenger series, George Griffiths' Honeymoon in Space, E. Nesbit's fantastical settings, and several others. FF has the feel of a well-loved and well-tended house game system. The available material's hugely useful as a background resource or to mine for ideas. Worth checking out if you're interested in the period. (1993, Victoriana) A German-language game where players take on the roles of detectives in the Victorian era, ala Sherlock Holmes. The name's a little odd to me as I usually associate the phrase "private eye" with Noir. I've listed this as 1993, but this is actually the publication date of the 3rd edition. I've had a hard time tracking down other information on the game. A Google-translated document I found suggests the earlier editions were amateur-press or fan produced. A larger, hardcover fourth edition appeared in 2008. (1993, Steampunk-esque) Mage the Ascension presents a war over shared reality, fought between mages who want to move the world towards their view of reality. The bad guys have a monolithic view of that reality, while the "good guys" of the Traditions have a freer and more fragmented approach. The Sons of Ether are one of these traditions, with a love of mad science and an aesthetic borrowed from Steampunk. The background for the Sons of Ether sourcebook cites the usual suspects- Babbage and Lovelace- and the author's clearly read The Difference Engine. I'd say this is the first time we see a distinctly "steampunk style" faction in an rpg. The art has all the classic motifs: goggles, gears, Victorian dress, and so on. MtA itself isn't steampunk, but it smartly borrows from a rising trend. White Wolf's always been good at incorporating those ideas and laying the groundwork for future use. As the Mage line evolved, you would see more and more of these aesthetics appear in the game and art. (1993, Steampunk/Victoriana) We had a local game store which, in the early days, almost always bought at least one copy of new and oddball rpg products. That resulted in a kind of orphan section of the shelves where these games went to sit for years: Nightlife, Whispering Vault, Dracula, Adventures in High Fantasy, and many others. Eventually they'd gather enough dust or show the thumb-marks of a thousand rejecting perusers at which point they'd drop back to the used section. Wooden Suits & Iron Men was one of those games I remember sitting, unloved, for years. The supplement itself is a world-book for Nightshift Games' short-lived DUEL System. It has a Babbage and verne-inspired future, populated with massive gadgets and, I believe, the first Steam-Mecha I saw in a game. The title's a nod to the Avalon Hill classic Wooden Ships & Iron Men. The focus for the supplement is on the gadget and machine creation system, for building great steam monstrosities. That's a particular theme we'd see much more of in later games. The product itself is fairly light, coming in at only 24 pages. 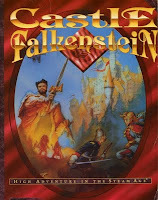 (1994, Steampunk/Victoriana) Castle Falkenstein raised the bar for Steampunk in RPGs. It takes the classic Vernian tropes and expands them. Steam machines, gadgets, and technology become central to the setting. But those devices aren't presented as an unquestionable good- there's consideration of the dark side of industrialization. The Steam Lords of the setting, primarily from England, face off against a heroic element which combines technology, magic, and diplomacy as a force for good. Cooperation, liberalism, and democracy counterbalance groups focusing exclusively on a single source of power (technology or magic). The setting smartly brings magic into the mix, making it more accessible for conventional fantasy gamers. That's necessary because the game itself makes a number of radical leaps in system and presentation. Cards are used in place of dice, there's an emphasis on narrative, character skills are abstracted, and players have to keep journals for their story. The mechanics submit to the genre conventions in a new way. In fact the system supports the ethos of the setting. The first-person narrative of the rule book explains those design decisions in a way few other games had. The core book manages to balance narrative with presentation of the background. It offers a lovely package- one of the nicest looking games of the period. I've heard criticisms that the alternate history presented is a little weak- but once you bring in sorcery, the Unseelie, and arcane engines, I think pretty much anything goes. 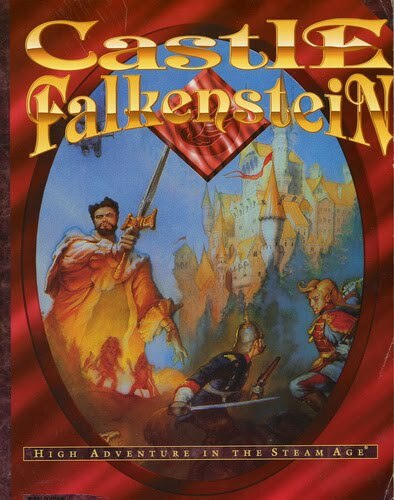 There's a certain irony that Castle Falkenstein comes from the company which brought the grit of Cyberpunk to gaming. But they share a similar focus on appearance and aesthetics as a crucial game element. For better or worse, style and feeling define these games. CF also reduced a number of amazing supplements well worth hunting down for anyone interested in Steampunk gaming. I reviewed the core book earlier By Sword, Steam and Magic. I've also done reviews for most of the supplements to the line. (1994, Steampunk) A French RPG I've had a hard time finding much about. One online commenter said, "Ecryme was an ugly game that was somewhat foolishly written in the style of a series of first-person narratives by characters attending a scientific congress. As a result the game was unreadable, even to me." The game's striking in that it appears to be one of the first Western steampunk RPGs to explicitly divorce the genre from a historical or alternate historical setting. Instead while it bears cultural similarties, it is a fantasy world made up of cities connected by bridges. Between them lies "ecryme" a liquid which eats through anything save metal and stone. The world has steampunk technology, some strange magical powers, and industrial overlords. The designer apparently wrote two novels based on his setting. (1994, Victoriana) Alongside Forgotten Realms, TSR's Ravenloft consistently sold strongly month after month in our local store. Ravenloft itself owes more than a little to Victorian literature, Dracula and Frankenstein, by way of their horror movie treatments. On the other hand, Masque of the Red Death fully embraces the Gothic literature and imagery popular in the Victorian era. This "add-on" to Ravenloft presents Gothic earth, using the D&D rules to offer a game more akin to CoC. Literary characters and historical figures both get character write-ups. The boxed set itself is pretty massive, with a main 128 book describing the setting and background. That's accompanied by three separate 32-page adventures, a DM's screen, poster, and a map. The mian booklet's a useful resource for anyone running Victorian Horror in the late 19th century. It is a striking and interesting product. It does beg the question how well D&D can emulate horror or a non-fantasy setting. White Wolf's Sword & Sorcery line pushed a version of this for d20, but I'm unsure how much changed between the editions. 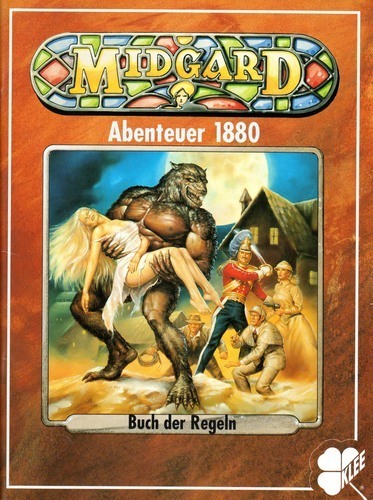 (1994, Victoriana) In some ways this feels like a version of Masque of the Red Death for the German fantasy system Midgard. It focuses on Germany of the period. The line did well enough to spawn about a half-dozen supplements. The game's historical fantasy, with the players fighting classic monsters of the period so far as I can tell. The blurb from the current German publisher Effing Flying Green Pig Press makes the pitch (via Google Translate) , "(MA 1880) takes you to the 19th Century and brings the era of the Great Adventure back to life: Learn strolling mummies, bloodthirsty werewolves, vampires and seductive art know people running amok. Fight ingenious master criminals, anarchists, and death-defying power-hungry secret societies in the tradition of Sherlock Holmes or Indiana Jones. Experience with Emin Pasha, Queen Victoria, Charles "Chinese" Gordon, Henry Stanley and other personalities story that is fancier than any fantasy. Or take part in the discovery of King Solomon's treasure chamber. Or invent a time machine and travel to the Morlocks." 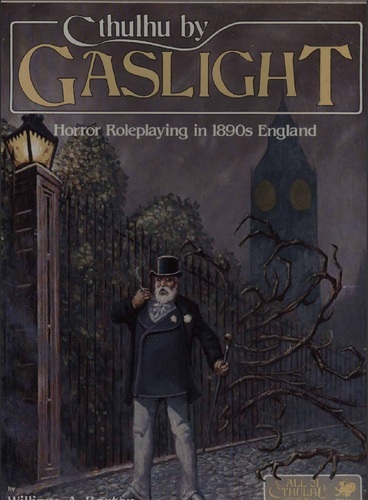 (1994, Victoriana) A purely subjective choice I my part, but I think a case can be made for Planescape borrowing heavily from Victorian culture and tropes. First, consider the Gothic fantasy-industrial design of the city. We have soot, smoke, and workhouses. The place feels Dickensian. The neighborhoods, the rot, the mazes- all common to fantasy settings, but given a weird mixed technology chic. Second, the cant and speak which emulates and directly borrows from British Street talk, so that everyone sounds like Artful Dodger. Third, the figure of the Great and Majestic Queen overseeing her Empire in the form of The Lady of Pain. Fourth, the bringing in of the Modrons which add a certain metal and gear look to everything. Fifth, the Factions as classic Victorian secret societies. As with those, they're driven less by practical purposes than by weird ideologies and new philosophies. I'm sure other parallels could be made- certainly Tony DiTerlizzi's art and design contribute to the impression. He notes borrowing from Yoshitaka Amano's style, which includes the often steampunk-y FF work. I'm not saying all of Planescape reflects this, but certainly the key city of Sigil feels this way. Planescape remains my favorite of the classic TSR settings. I hope they release all of this material as pdf, but I also hope they eventually present a reprint or print-on-demand option for it. (1995, Victoriana) A rules-lite rpg set in a fantastic version of the Victorian Empire, complete with magic and monsters. Written by Gareth-Michael Skarka, I've had trouble tracking down concrete information on the game, save that it went off the market after Microsoft objected to the name. I don't know if that's true or an urban myth. 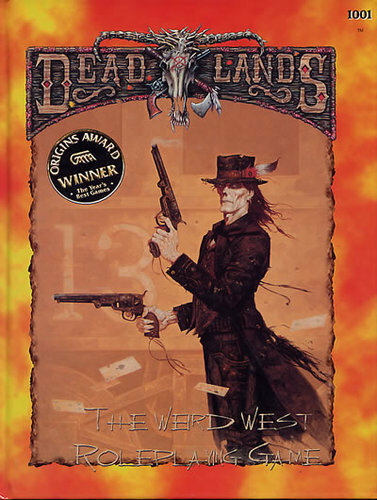 (1996, Steampunk) With Deadlands, steampunk as an element explodes. CF and others had begun to use some elements, but they never had the reach that Deadlands did. It made it fun, awesome, crazy, and lunatic- splitting it away from the Victorian and Vernian cultural influences. Instead we have gears, robots, gadgets, and mad science by way of Ghostbusters; Wild, Wild, West; and Saturday morning cartoons. All kinds of manic steam science stood alongside the undead, Cthulhoid spawn, and gambler mages. PCs could play a Mad Scientist right out of the gate. They had their own sourcebook with Smith & Robards. Several supplements focused on the "New Science" as well- The Collegium and City o' Gloom. Steampunk science, like everything else in the setting, is a double-edged sword. Useful but destructive- it is the fever dream of industrialization. (1996, Victoriana) This is honestly one of the strangest sourcebooks I've ever read. At the time Pagan Publishing was putting out some of the most amazing and interesting Call of Cthulhu material. They still do today- but at a much reduced pace. So, as with many people, I went into this expecting an amazing and Lovecraftian spin on a group I'd see discussed in every single rpg touching on the modern occult. What I got instead was a potent, sober, exacting, and meticulous presentation of The Golden Dawn as it appeared in the real world, with suggestions on how to integrate that into a campaign. Even the adventures step away from classic cosmic horror to offer the players dealing with the return of a King Arthur. This offers the best sourcebook on Victorian Occult and Mysticism. It isn't a conventional CoC book. Instead its one of the best researched and presented historical sourcebooks I've ever seen. Unfortunately it isn't yet available as a pdf and original copies go for high dollar on ebay and Amazon. (1996, Victoriana-esque) I only discovered recently that this setting came from an rpg published in New Zealand in the 1980s. I haven't been able to locate specifics on that, so I'm listing it here under the later edition. 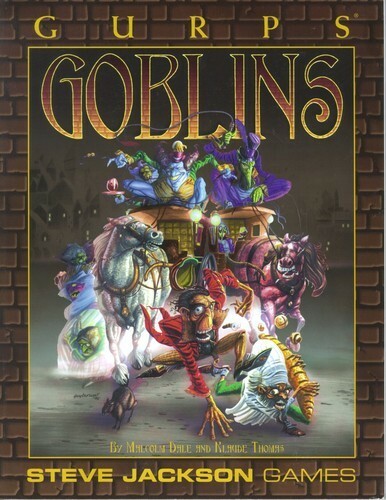 The game has the players becoming goblins in an awful, awful Victorian-esque setting. You embrace the rudeness, filth, and suffering of that period. Malcolm Dale and Klaude Thomas published designer notes (found here). The game draws heavily on Mayhew's London's Underworld. It combines that with a fantasy setting to create a unique and unpleasant setting- with PCs suffering various forms of mistreatments like "Fed to Pigs" or Pawned to Surgeons." A useful resource for those running Steampunk Fantasy who want a distinct and septic non-human underclass. Space 1889 also had a Savage Worlds version recently. 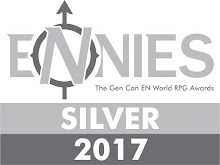 Also worth mentioning in future installments: Engines & Empires, the Abney Park rpg, Clockwork & Chivarly, and Verne for EABA. I'm working on the lists and I've made it up through 2006. Its always good to have feedback so I can cross-check to make sure I haven't missed anything vital (as I inevitably will). Great list! Looking forward to more. You can try the Facebook and Google+ groups "Victorian Gamers Association" for more idea. I gave your blog a shout out at both. Excellent- thanks for doing that. I've always wanted to give Masque of the Red Death a go, if only because the idea of a Victorian horror game running on AD&D2 seems so bizarre that it might be fun. I bought that during the brief time DriveThru had the TSR pdfs for sale years ago. I recall it being interesting, but filled with lots of stats. It had decent and dense location maps as well. I lost the pdf in a hard-drive crash, so I'm hoping it will eventually reappear in the new round of WotC reprints on the site. Yay! Some Gear Antique love. Very fun toys in that game and rules for making more both in-game and meta-wise. 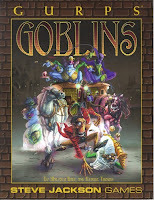 Not too long ago I flogged my copy of GURPS Goblins on ebay as I never really got on with the system that well. I wish I had thought of using them as a sub-human class in some of my other steampunk games though. Chill? 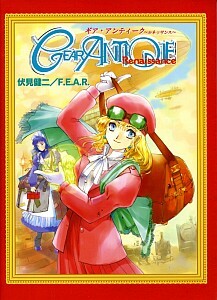 I really don't know anything about it, but I remember the cover looked very Victorian. From what I've seen, Chill has more of a 20th century focus. I believe the PCs are characters in a modern setting (so the 80's and 90's for the time). It is my impression- and I could be wrong- that the Chronicle City edition I mentioned above is actually going to be an English-language translation of the German version you mention. That's an interesting switch.